Discover 28 Fun & Effective Drills For Developing an All-Star Hitter! Build Rock-Solid Hitting Mechanics, Increase Confidence At The Plate, And Dramatically Boost Your Bat Speed and Power! Introducing the Softball Hitting Skills and Drills eBook. It's jam-packed with 28 innovative hitting drills that show you exactly how to develop a picture-perfect swing. So you can start using these drills TONIGHT (even if you're new to coaching). You'll get instant access to a wide variety of drills for all ages and competitive levels. Drills for basic hitting fundamentals and mechanics. Drills for fixing common hitting mistakes. Drills to inject more bat speed and power into your swing. And drills to prepare for real game situations. You can use them for team batting practice, small groups, workouts at the cage, or even at home in the back yard. No matter how you use the drills, you're guaranteed to see dramatic improvements in the your batting average, power, and confidence at the plate! Stride Box Drill: Run this simple drill to fix "overstriding" and "toe-pointing" - two of the most common mistakes that plague softball hitters! Two Strike Drill: How to adjust your stance and swing path when the pitcher has the upper hand… so you can cover more of the strike zone, minimize strikeouts, and maximize your chance of putting the ball into play! I've pulled together in one simple collection the most essential softball hitting drills you need, to help your girls dramatically improve their skills and win more games. The confidence you'll feel, walking onto the field at your next practice, armed with an arsenal of creative hitting drills your players will love. So if you're serious about becoming a better coach, and if you would like to instantly have a proven plan to develop top-notch hitting skills, click the Add to Cart button below now. It's just 36 pages. Short enough to read in one sitting. Click the Add to Cart button below to get instant access to Softball Hitting Skills and Drills Risk Free for just $7. YES, I want access to the Softball Hitting Skills and Drills eBook. Please give me INSTANT access to 28 skill building drills! We've already done the research... spent the time filtering out what doesn't work… and compiling it all into this incredible "best of" hitting drill collection. There's no need to waste your time searching the web for unproven ideas, or spend hundreds of dollars on coaching clinics. Just download Softball Hitting Skills and Drills and you'll get instant access to a complete training system you can start using today! Softball Hitting Skills and Drills is designed for youth softball players and teams age 8-18. It’s packed with fundamental drills for teaching the basics, along with more advanced techniques for experienced players. Softball Hitting Skills and Drills is an eBook delivered in PDF format. As soon as your order is securely processed, we’ll direct you into our members area, where you get instant access to all the material. 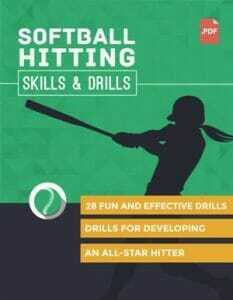 Hurry... Get Softball Hitting Skills and Drills Now!